Today we decided to give the morning a try line class shark fishing on the Trade In, this time using 2# test for a mako. We did one long drift on the good bottom structure just to the east of the Cigar. The water was 71 degrees and green. We had a great drift to the North. Action was slow with just a few small hammerheads swimming through the slick today. The wind came on strong around 11 so we got out of there before the forecasted 20-30 knot winds filled in. 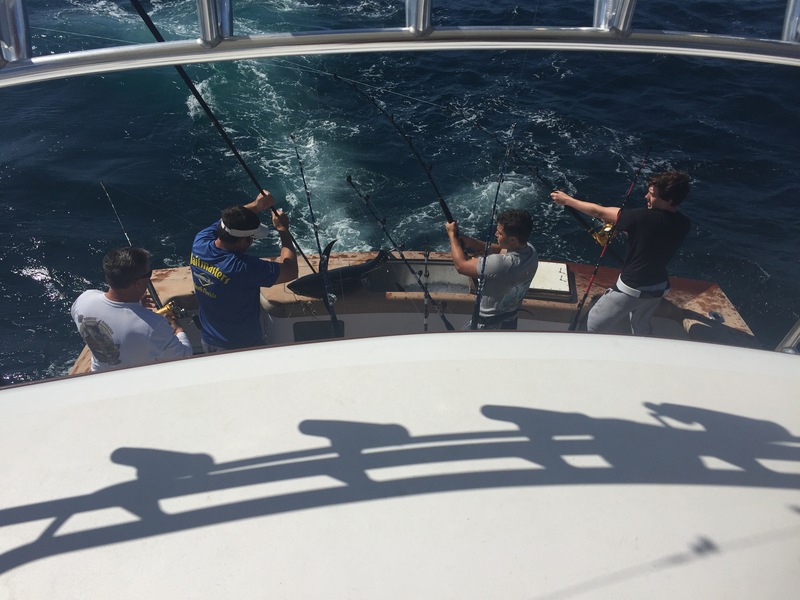 We had a 16 hour charter on Exile 65 and went searching for tuna. With the scattered reports we decided to focus our efforts fishing the Spencer Canyon and it paid off. The water temp was 71.5 and green, but we marked some bait in the tip which is where we had all of our bites. The morning started slow but at 830am the bite started. We caught a double header of yellowfin but only one was a keeper. 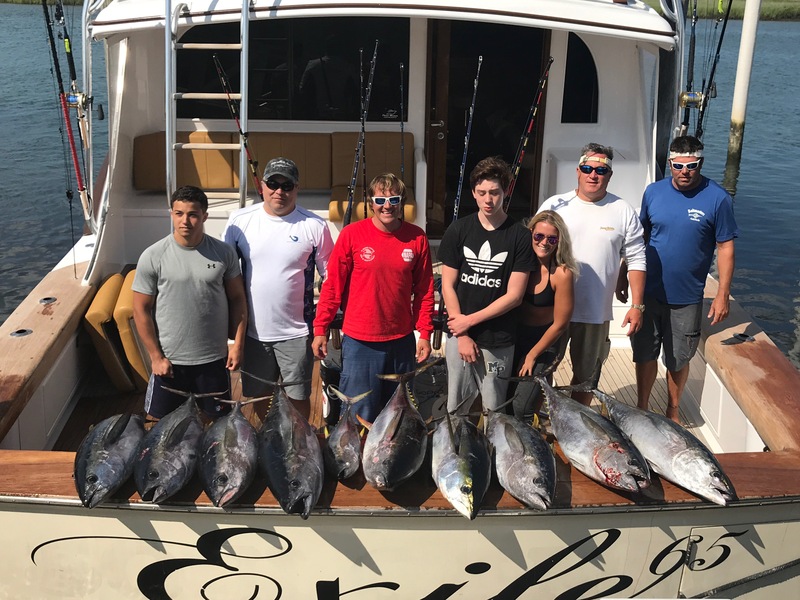 Soon after we had a triple of nice yellowfins in the upper 40# class and then tripled up again with two nicer ones in this mix that went 55 pounds. We picked at a few more singles of nice size yellowfins and ended the day early with 10 yellowfin tuna in the boat! Sea witches and tuna flares with ballyhoo accounted for the majority of our tunas. Awesome day of tuna fishing! We slipped out on the Trade In to catch the last two hours of the incoming tide in the back bay around Somers Point. The water is still cold for this time of year at 62 degrees. 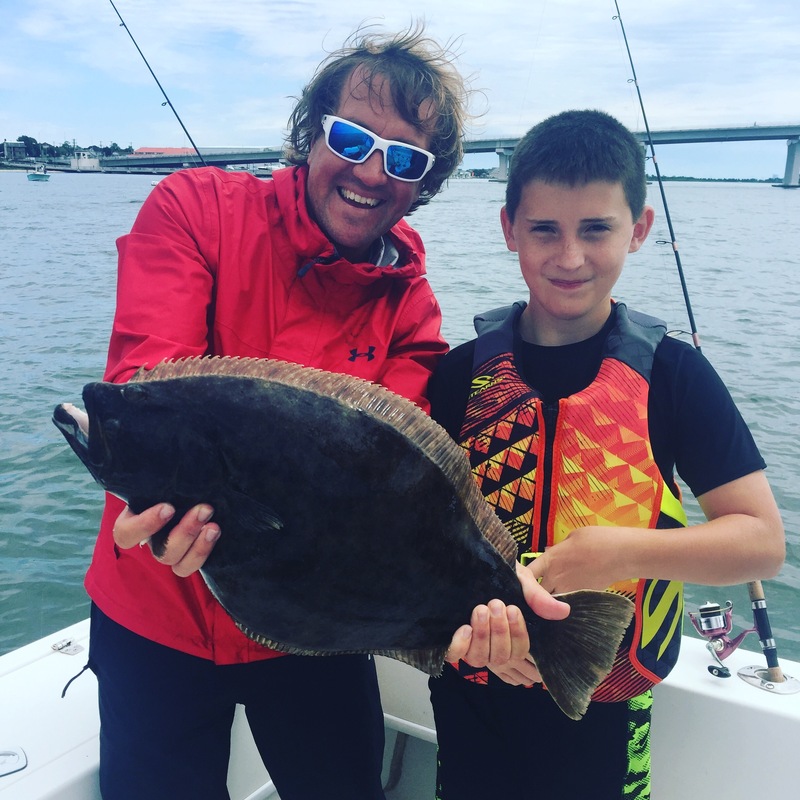 We had good action catching 10 and one nice keeper that went 26″. Fun little quick trip with Maureen’s grandkids. Well June has been pretty tough to slip out on the trips we have had setup and it’s a bummer because the bite is on!!! 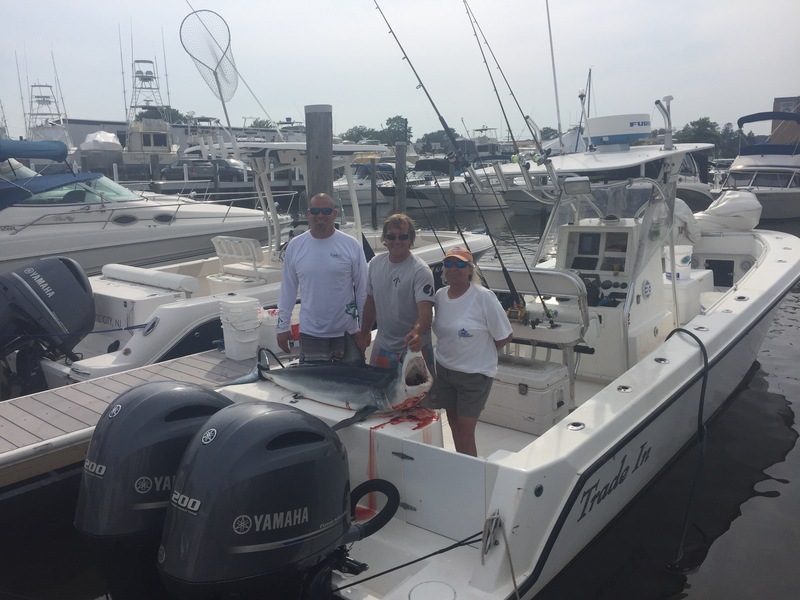 We were able to slip on on the Trade In searching for a Mako Shark line class record for Maureen Klause. We started our day fishing along the 20 line 35 miles out of GE Inlet and we had a few mystery shark bites and a dusky come in and mess with out baits that we played with on the spinning rod. After a 2.5 hour drift in 70 degree green water we picked up an made a move a little further offshore. We spent an hour and a half here with a terrible drift so we picked up and moved further offshore to Lemkes and say a big hammerhead on the surface as we pulled into this spot. A few dolphins were around, lots of slicks, but the water was 72 degrees and still green. We decided to give it a try. It wasn’t long before we had a nice Mako eying up our long bait. 15 minutes later he finally committed but we weren’t able to get the Mako to switch off to Maureen’s 6# test rod. Bummer. 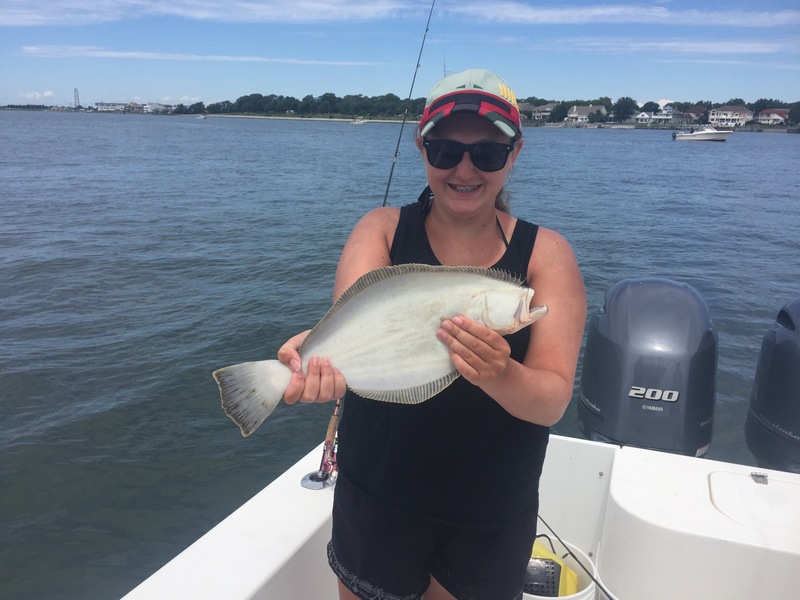 8-10 pound bluefish started to come and go in our slick so we grabbed a few of those for bait. In the middle of all of this we had 2 4′ hammerheads come through and try to eat everything we had. We hooked one up on the spinner so we could get rid of them. About a half hour later we had a Mako we called 130 pounds swim right up under the boat and look at Maureen’s bait but no go. 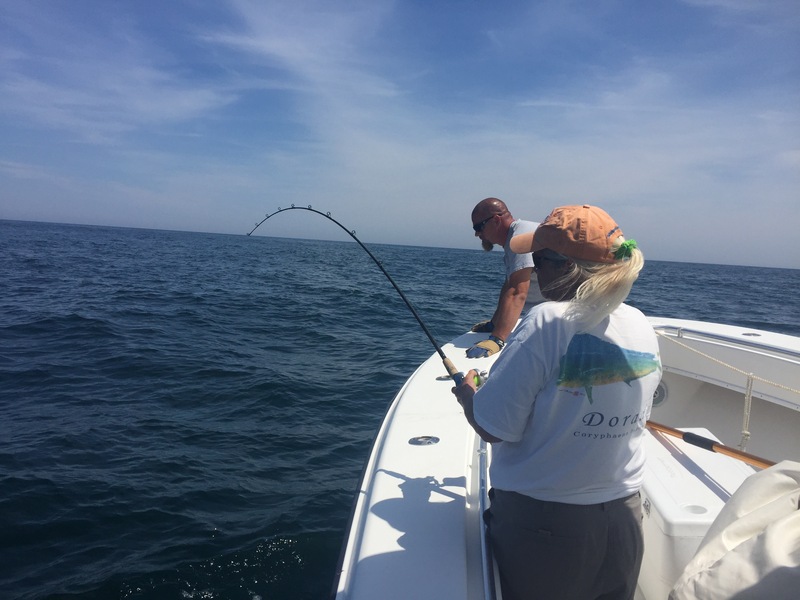 We waited him out and finally the Mako got fired up on our surface bait and he switched off to Maureen’s 6# test rod and game one! We got an awesome jump out of the fish and had to fire up the engines and start the chase. After chasing the fish for 25 minutes the leader came within reach on Cullen’s hand and he wired the fish up to the gaff shot. I ran from the helm, and stuck the flying gaff into the mako and the gaff head ripped out of the fish. I grabbed the second Graf and hit it in the head, stuck the third in (which is now the second) and went to grab the tail rope with Cullen holding the two gaffs ad the leader when the fish started to spin. I stuck another gaff into the mako and it snapped it like a twig. Oh Boy. Why the IGFA rules don’t allow a bang stick is beyond me. But anyway we got the tail rope on the fish and it flipped out again and twisted the existing gaffs into pretzels and the cable cinched down and cut Cullen’s thumb. Not good. I flipped the fish into the boat, we cleaned up and wrapped Cullen’s thumb and took off for home. The Mako weighed in at 126.4 pounds which beats the 43 year old existing 6# test line class world record by 11 pounds!!! Congratulations Mo!!! So now it is pending until IGFA tests the line but what a fun day. Cullen got all squared away, stitched up, and hopefully it heals quickly.